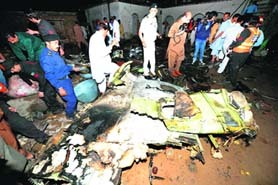 A Boeing 737 aircraft of private Bhoja Air carrying 127 passengers and crew coming from Karachi crashed near the Islamabad airport on Friday evening leaving no survivor. 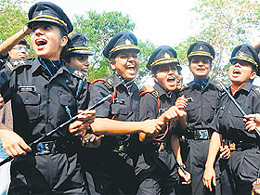 The Supreme Court today took the government to task for releasing Short Service Commissioned women officers of the Army from service at the end of their tenures despite the fact that the Delhi High Court had issued a directive on March 12, 2010 to offer them permanent commission. 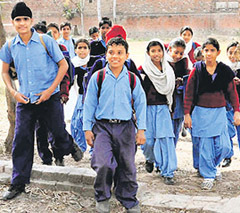 Punjab Chief Minister Parkash Singh Badal has ordered an inquiry into the utilisation of Rs 50 crore released for uniforms of school students under the Sarv Shiksha Abhiyan. This comes following recent reports of Rs 5-crore embezzlement in Gurdaspur. Vijay Kumar from Nangal, who was being treated for swine flu at Dayanand Medical College and Hospital here, died today. This is the first such casualty in the state this year. The controversy over the killing of two Kerala fishermen by two Italian mariners last month took a new turn today, with the Centre maintaining in the Supreme Court that the state police had no jurisdiction to prosecute the accused in the case. Newly released data from Europe reveals worrying trends about the economic downturn and its impact on Western economies. India may not be directly or immediately affected by whether Greece defaults on its loans and how Spain, Italy and Ireland plan to service their debts in the coming months, but all four European countries are members of the Eurozone and fears for their financial stability have led to worries about survival of the single currency and the future of the European market that absorbs so much of India�s and the rest of Asia�s exports.